Often times when I consider ideas of identity, it is easier to say who I am not rather than who I am. When others try to put me into a box, it is easier to point out why I do not belong there than to offer an alternative categorization. The concept for my exhibit evolved from this idea of discrepancy in identity and the desire to express how I differ from societal expectations. In art classes, we tend to joke about the poor math skills of artists, but over the past four years I have noticed how bothered I get by this practice. Throughout my years in school, my parents placed great emphasis on academics, and I was able to experience success, particularly in math. I cannot say with much certainty if I have maintained the same mathematical abilities as I had in high school. However, I can say that I am frustrated with the idea that some people will underestimate my abilities simply because I am an artist. When I first began coming up with concepts for senior show, this frustration was on my mind. Originally, I wanted to use this work to prove that while I am an artist, I am not bad at math. I considered exploring the forms and typographical qualities of calculus equations to demonstrate the integration of the arts and academics. However, after speaking with Professor Prescott about the “artist personality,” I realized that there are many assumptions about artists other than those regarding our math abilities. I then began considering using typography to represent a statistical analysis of the behaviors and personalities of Messiah College’s artists. I planned to survey the art faculty and students about various artist stereotypes, hoping to discover that such stereotypes were not true. Statistically, do artists have troubled childhoods and substance abuse issues? Are artists more introverted or extroverted? Liberal or conservative? I hoped to find out what was true. Stereotypes about artists were things I never really thought about before. Discussions about stereotypes and identity usually required me to talk about my race and what it is like being Asian-American. It was an interesting process talking about something other than race in a discussion of stereotypes. However, as much as I may get tired of talking about race or racism, I realized that it is an integral part of my identity. I realized that if I were to do a project that explored stereotypes, race could not be ignored. My concept then expanded to the exploration of stereotypes about artists, Asians, Christians, and women – and also narrowed its focus on me as an individual and the various ways I think I break these stereotypes. I chose to use movie stills to represent the stereotypes, because media are often the ones responsible for perpetuating generalizations about various people groups. I decided to use digital photography to explore self-perception because I consider myself an artist when I am behind a camera more so than when I am in front of a computer. The layout of my piece was influenced by these images by Robert Rauschenberg and April Greiman. 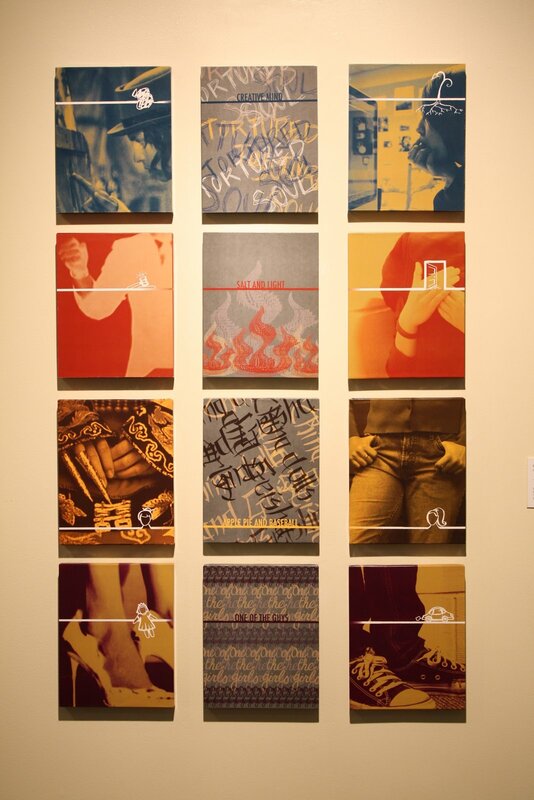 Each row focuses on a particular stereotype, and when arranged in a grid creates two fragmented full-body portraits that integrate the various aspects of my identity.The portrait on the left expresses what I should look like according to society’s expectations while the column on the right acts as a self-portrait. I used the middle column to connect and contrast the two portraits both visually and conceptually through the use of type. The first row focuses on the artist aspect of my identity. For this stereotype, I chose to use a movie still from “Benny and Joon,” in which one of the main characters is an artist with a diagnosed mental disorder. Johnny Depp plays Sam, another highly creative character with mental issues of his own. This semester I have had the pleasure of taking Abnormal Psychology and learned that research has shown a correlation between creativity and psychosis. This perhaps may serve as a basis for the “crazy artist” image and the stereotypical inner turmoil that drives and inspires the art and creative process. Art has never really been an act of catharsis for me, or an outlet to express the emotional struggles that I am experiencing. The closest I have gotten to this is carrying my camera along with me when I feel like taking a walk during times of stress. I do not sit waiting for divine inspiration, either. I take a much more logical or analytic approach to my work, making lists and jotting down ideas as I brainstorm or look up ideas and imagery online.The second row represents ideas of what it means to be a Christian. Media representations of Christianity are often in a negative light, showing us to be hypocritical like Mandy Moore’s character in the movie Saved! or judgmental like the members of Westboro Baptist Church, founders of GodHatesFags.com. We see that congregation on the news picketing funerals and blaming homosexuals for 9/11 and Hurricane Katrina. The media image used for this aspect of identity is from Footloose, a film that depicts the citizens of the small Christian town of Bomont to be close-minded and suspicious of music, books, and dancing – and new people in general. I fear that people have this image of judgmental Christians in mind without understanding that Christ lived with an open door of love and compassion.The third row depicts my perception of being Asian. This was a particularly difficult set of images to create, because I wasn’t exactly sure what I wanted to communicate. My parents had lived in the States for about 20 years before I was born, and they raised me in suburban white America. This made it difficult to think about what it means to be Asian, because I generally do not think of myself as Asian, but as culturally white. I chose, then, to explore the assumption that being Asian in appearance means being Asian in culture. The movie still from “Crouching Tiger, Hidden Dragon” features what seems to be traditional dress, something that we would consider exotic and foreign. The placement of the hands is somewhat structured and suggests someone subdued, a trait we generally associate with Asians. I decided to counter this with blue jeans, attire that is culturally generic with no connotations of foreignness. My posture is informal and not submissive, but perhaps suggests a sense of defiance.I used the final row to explore issues of womanhood and femininity. In the movie “In Her Shoes,” from which I got the movie still, shoes were the common ground between two sisters who were polar opposites. Shoes and womanhood were among the very few things that the two women shared. This image of the stiletto heel represents the societal expectation that femininity is synonymous with being a woman. Dolls, dresses, high heels – all women are expected to enjoy these things; those who don’t are somehow less feminine and perhaps even less of a woman. I contrasted the image of the high heels with an image of my Chuck Taylors, well-worn and well-loved, and not typically feminine. As I consider my personality, I find that I am not particularly feminine either. When I am in a group of guys, I tend to become one of the guys rather than stick out as the only girl. I have learned that even the way I handle stress is typical of males rather than females. Some may say that all these differences make me atypical, or less than what they were expecting me to be. Those who hold such views or expectations have probably allowed the label to become the identity, and therefore expect something unrealistic. These differences do not make me any less of a person, but rather they make me more of an individual and more of myself.